As the clock ticked down to Thursday's transfer deadline it was not Manchester United, Chelsea or Liverpool that were on everyone's lips, but Queens Park Rangers. Some called it a trolley dash, others described it as financial roulette, but as the dust settled on another transfer window, it was impossible to dispute that Harry Redknapp's squad was better equipped to remain in the Premier League. First came a striker. That was Loic Remy, the fluid French forward, who completed an £8m transfer from Marseille. Then came the unsuccessful attempt to persuade Yann M'Vila to move to England. But it was the outlay on deadline day that raised more eyebrows and prompted new questions. The deal for Christopher Samba, the towering central defender, broke the club's transfer record for the second time in a fortnight. The fee was £12.5m, the contract worth more than £20m over the four-and-a-half-year deal - an incredible commitment for a 28-year-old. QPR had met with Samba in the summer of 2012. 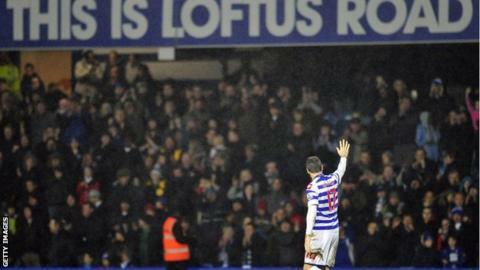 A deal had been discussed, but the Loftus Road club would not meet his wage demands of £100,000 per week. Six months on and the club's increasingly perilous position in the Premier League changed that position. "It is not Chris Samba's fault that they are paying him £100,000 per week, he will be absolutely buzzing," former Blackburn midfielder Robbie Savage told BBC Sport. "But 100 grand a week? And they could drop into the Championship. It is madness. You look at what happened to Pompey and it was really, really sad. I know QPR are funded very well by Tony Fernandes. But it is a huge gamble." The additions of Jermaine Jenas and Andros Townsend with an hour left on deadline added to the wage bill, although an offer for West Brom striker Peter Odemwingie didn't come to fruition. QPR have been among the most active Premier League clubs in the market since the arrival of Fernandes in October 2011. Having preached the need for prudence and stability and insisted he would not bankroll the club, he has found the pressure of sustaining Premier League football forcing his hand. Under previous manager Mark Hughes, Ji-Sung Park, Robert Green, Junior Hoilett, Ryan Nelsen, Andrew Johnson all arrived to boost a squad and a wage bill already boasting Kieron Dyer, Joey Barton, Luke Young, Shaun Wright-Phillips, Anton Ferdinand, Nedum Onuoha, Djibril Cisse and Bobby Zamora. It is a recruitment pattern that is ambitious, extravagant but incredibly risky should Redknapp not be able to keep the club in the top division. "If the worst happens the financial position QPR will be in doesn't bear thinking about," former Bolton manager Owen Coyle told BBC Sport. "This feels like a club panicking." The figures spent on Remy and Samba are startling. The vast sums of money do not tally with a club battling to avoid the drop. QPR's total investment in both players across the term of their contract totals close to £80m. Nobody at Loftus Road is pretending the model is self-sustainable in the short term, but having already committed vast sums to the wage bill it is felt it is better to roll the dice again in the hope of staying up and cashing in on the lucrative new three-year TV rights deal which kicks in next season. "The wages being paid at QPR are hard for the common man to understand," former Spurs and Luton manager David Pleat told BBC Sport. "Given the crowds that they get it seems a rather strange wage scale that they have. It is a salary scale that will get them in trouble. It is a difficult market and the weaker clubs do seem to suffer. They are facing relegation and have the fans pressing them to make signings. "You have got to have strong management at this time and make plans and say we want to sign X and stick to that. Otherwise it just becomes a spiral, a sense of panic." And yet if Redknapp can use these new players to steer the club away from danger will the reward justify the risk? Comparisons with Portsmouth and Leeds have been made but there are other examples at Fulham, Middlesbrough and Bolton as clubs who speculated, albeit not at this level, to accumulate. And QPR certainly do look an awful lot healthier than they did a few days ago. To a squad denounced for lack of quality, Redknapp has added players of international quality. Samba may be considered something of a plodder, but he is tall, aggressive and dominant — just what QPR's defence has lacked. "Harry has had four very good draws," Pleat added. "He has got them organised, played on the counter attack. He has got a win against Chelsea, a point against Manchester City, a point against Spurs - he has nothing fear now. "He is only a few points behind the clubs ahead of them but with the players he has brought in can help him bridge that gap." In QPR's Championship-winning season of 2010-11, the wages to turnover ratio was 183%. The current accounts make even more difficult reading. So much depends on Premier League football. Planning permission has already been secured for a new training ground at Warren Farm, locations are being considered for a new stadium. There is certainly a longer-term desire to move towards self-sustainability but for now QPR are pushing the financial boundaries and rolling the dice once more.